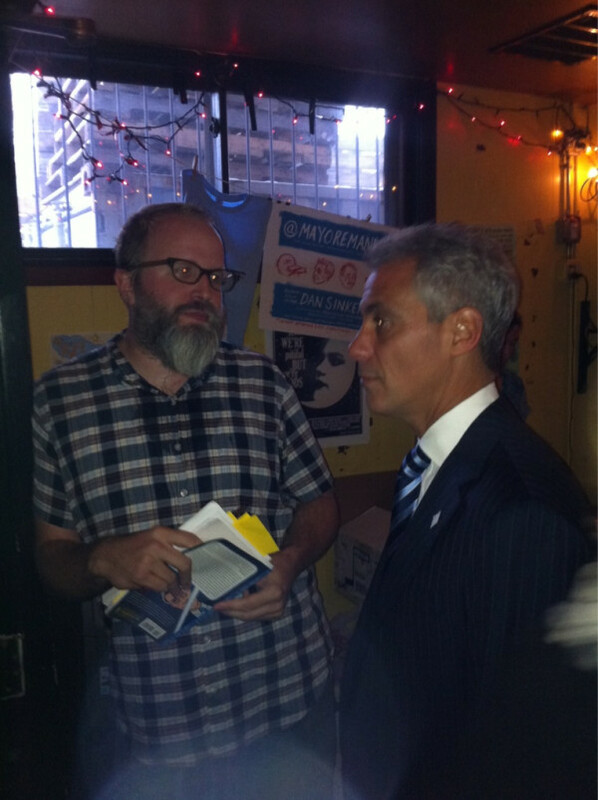 Last night Chicago Bar The Hideout was the scene of almost paradoxical event, as Mayor Rahm Emanuel signed copies of the book The F***cking Epic Twitter Quest of @MayorEmanuel, and schmoozed with guests who had come to support his Twitter impostor. 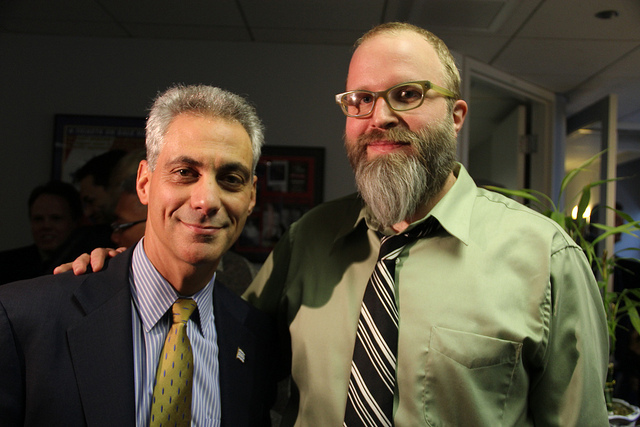 Dan Sinker, the man behind the Twitter account @MayorEmanuel rocketed to fame earlier this year with his filth-laden tweet stream impersonating then-candidate Emanuel, who is known for having a rather spicy vocabulary. The book contains all of Sinker’s tweets from the gag, as well as an explanation. Caricaturing the notoriously dirty-mouthed former White House chief of staff, the Twitter account was a sensation as the election came to a close last week. @MayorEmanuel wrote nearly 2000 tweets in five months and collected several times as many followers as Rahm Emanuel’s real account. Since its last — and apparently final — update on Thursday night, some 1500 Tweets have been issued about the fake account . Before becoming an Internet sensation, Sinker was the publisher of Punk Planet, and a recipient of the Knight Journalism Fellowship, spending a year at Stanford University. Chicago Mayor Rahm Emanuel (the real one) is President Barack Obama’s former Chief of Staff, as mentioned earlier, a former member of Congress, and his brother Ari Emanuel is a Hollywood agent who is the inspiration for the character Ari Gold in the HBO series Entourage. Emmanuel is also a man about town, and seems to get the importance of social media and technology. Last week he was seen checking out startups at Excelerate Labs Demo Day, along with Alex Wilhelm of The Next Web.